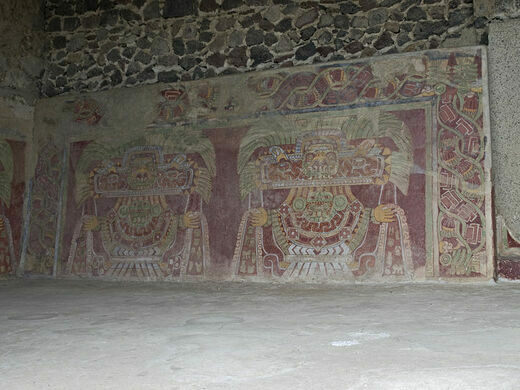 The Great Goddess, a mysterious deity of the Teotihuacan civilization, has been found depicted in several locations at the Teotihuacan archaeological site, including this striking mural at the Tetitla compound. 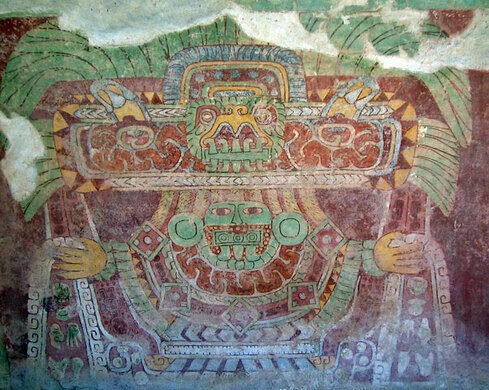 But the exact meaning of the Goddess in the cosmovision of the Teotihuacan civilization remains an inscrutable mystery, yet to be deciphered fully despite many years of research. The Great Goddess in the mural of Tetitla wears an extravagant headdress reminiscent of those worn by dancers at Brazilian carnival. It is made of long green quetzal feathers, which fan out around her which are believed to represent the rays of the sun. Her headgear is decorated with the central image of a birds head. The species that this avian adornment is meant to portray is widely believed to be either a quetzal or an owl. A huge necklace hangs from her neck with patterns that suggest the belly of a snake and are repeated in aspects of her long flowing robes whose hems she lifts in her yellow hands. 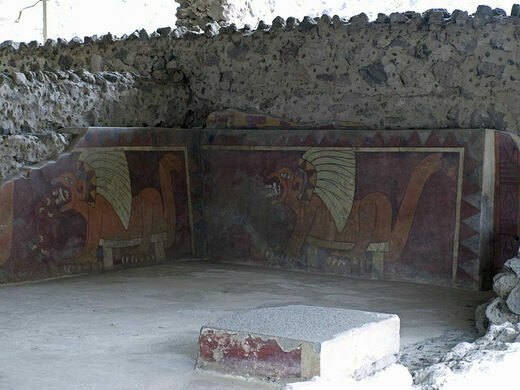 Fresco paintings surround the mural portray a bestiary of fierce animals, such as snarling pumas gnashing formidable fangs that wear headdresses of quetzal feathers. Symbols believed to represent the human hearts of sacrificial victims appear close to the maws of these big cats. In one of the surviving frescos, a shrieking eagle with its talons outstretched can be seen, as can the head of a sly coyote or wolf. There are also smaller figures that look like mortal humans, perhaps lords or priests, but could be intended to represent spiritual entities. There have been various hypotheses proposed by archeologists and anthropologists over the decades to explain what this mysterious figure and her animal consorts meant to the Teotihuacanos. Some scholars believe that clues as to her identity can be seen in the animals she is portrayed alongside. The spider, the owl, the jaguar, and the puma were all animals associated with the night, caves and darkness by the majority of the Mesoamerican civilizations. This connection, according to proponents of the theory, indicates that she is none other than the Goddess of the realm of the underworld. Others theories have reasoned that she is a representation of a mother Goddess, a divinity of warfare, water, and earth, or may even be a portrayal of several female deities rather than a single deity. But with a notable lack of any single conclusive theory, the significance of this mysterious being remains obscured by the sands of time. 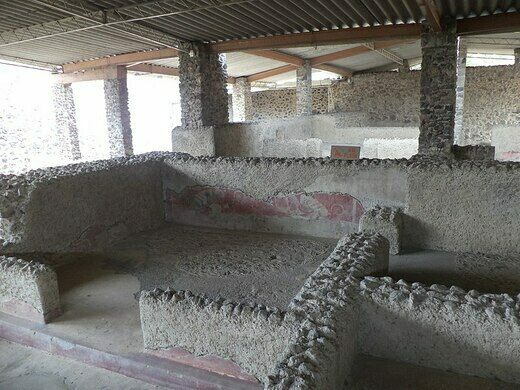 The Teotihuacan archeological site (including Tetitla most of the time, except when it is undergoing research) is open from Tuesday to Sunday from 9 a.m. to 5 p.m. The price of entry is $75 pesos and includes entrance to the museum. Once at Teotihuacan, you will find directions to Tetitla easily as it is signposted and labeled on the paper map that you receive upon entering. If unsure or lost just find your bearings by walking to the "Avenue of the Dead" where there are usually staff happy to point visitors in the right direction. 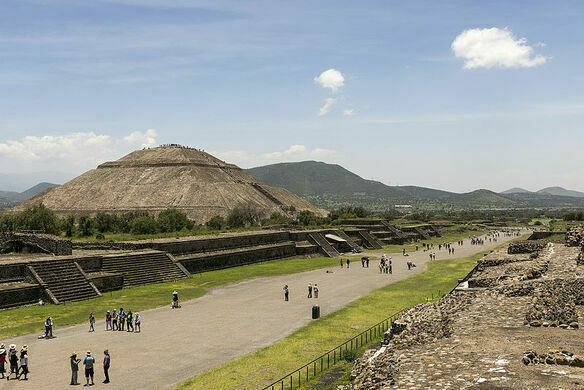 The best time to visit Teotihuacan is during the first half of the day as the sun can be mercilessly hot from noon onwards. Remember to bring basics like water, a hat, and sunblock as there is a risk of sunstroke. Wear decent footwear and be careful by pacing yourself when climbing the pyramids. 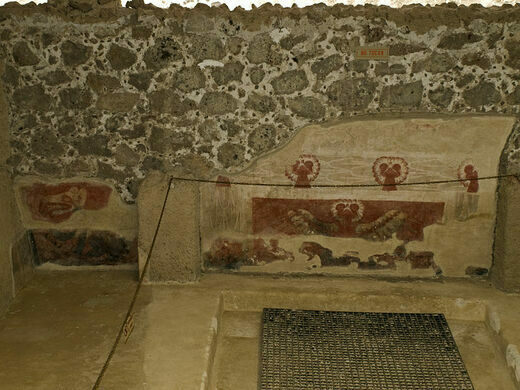 Dating back to the second century, vestiges of prehispanic mural paintings are found in this underground palace. Mexico's first public cable car soars over the congested streets outside Mexico City.